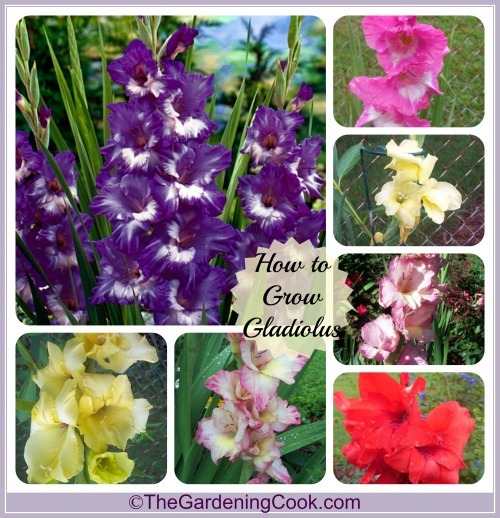 Growing perennials means lots of color when you plant gladioli. There is something about a bare piece of ground that suddenly breaks with foliage at an amazing rate and then bursts in a splendid show of flowers a few weeks later. 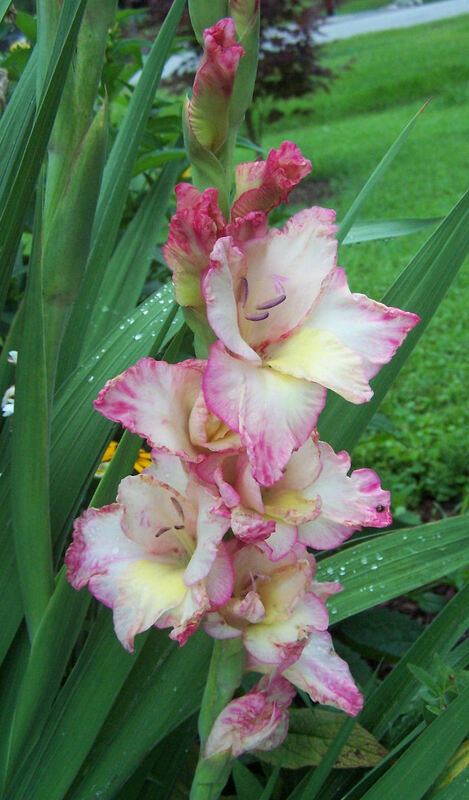 Gladiolus are not actually bulbs but are considered perennial corms. 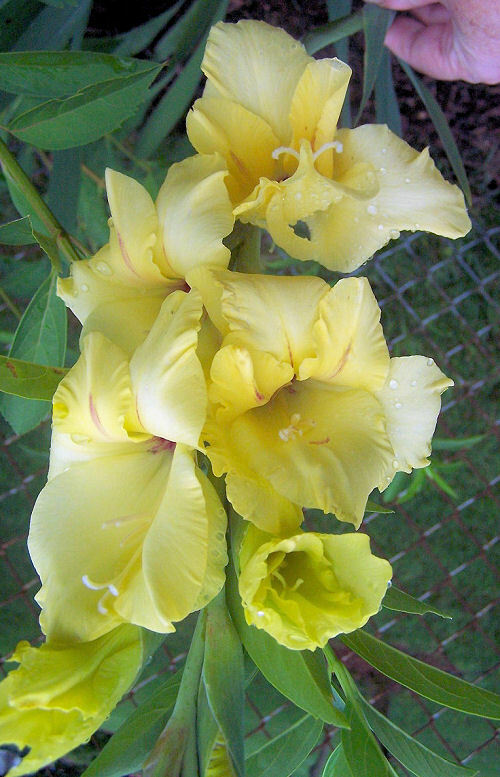 Gladiolus is often called a bulb, but it is actually a corm. See my article to understand the differences in flower bulbs. I remember having my lunch outside one year watching each day as these beauties kept getting taller and taller. There was so much anticipation for the flowers to finally appear. And they did not disappoint! 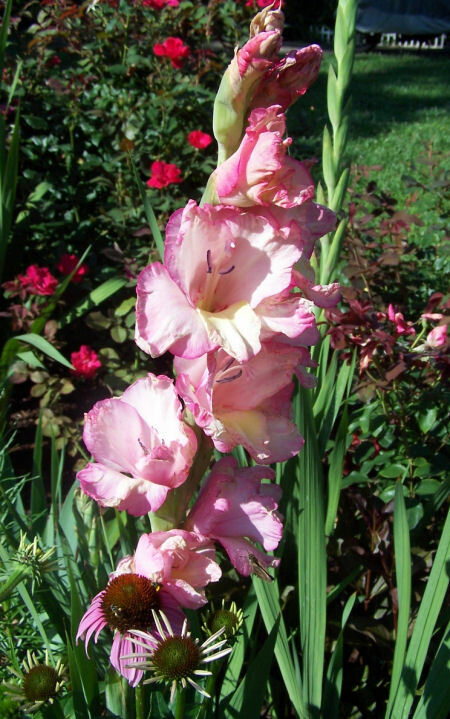 Gladiolus is one tough heat loving perennial bulb. A corm is a rounded underground storage organ that is present in plants such as crocuses, gladioli, and cyclamens, consisting of a swollen stem base covered with scale leaves. And flowers of course! There are so many varieties that can be grown and they are easy in most gardens. 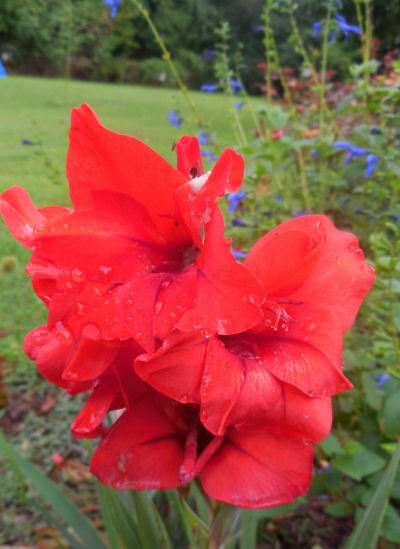 I love gladioli because they make spectacular cut flowers and attract bees and butterflies like crazy to my garden. Here is how to grow them. Plant gladioli corms in the spring after danger of frost has passed. Loosen the soil to about 12 to 15 inches. (these are tall plants and need a good root system. Add organic matter to the hold and plant the bulbs about 3-6 inches apart and water well. Now is the time to stake if you are planting tall varieties, so that you don’t damage the plant with a stake later. Days to flowering is about 90 days. If you like cut flowers, cut the stems when 1 or two flowers are open. The others will continue to open when place in water. Be sure to leave some of the leaves after cutting the flowers. The corms need them to provide nutrition for next year’s growth. Zones 7 or 8 need just a layer of hay or straw. If you live in colder zones, you will need to dig up the corms, dry them and store them at 35-45 º F until the spring and then plant again. 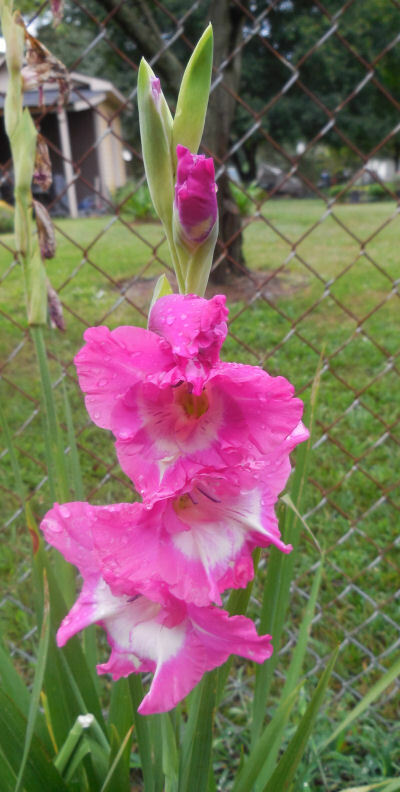 Here are some of the gladioli blooms that graced my garden this year. 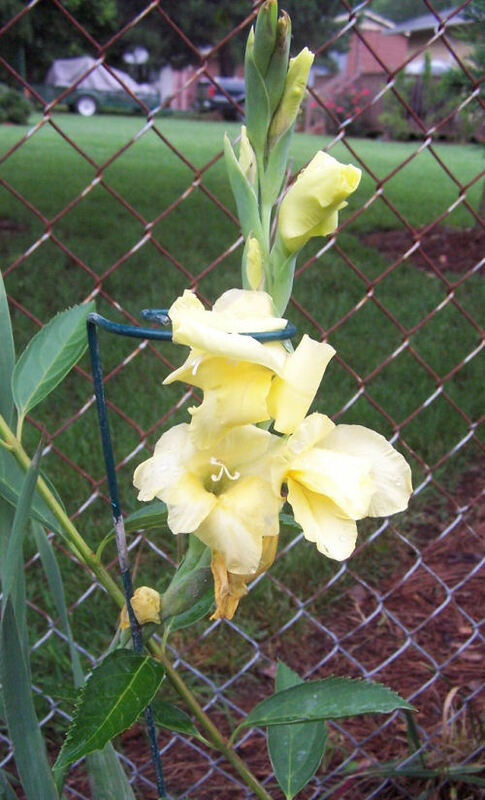 This pretty yellow gladiolus was a late bloomer for me this year. It bloomed in my test garden in late July. Close up of the yellow one. I was so surprised to see it flowering when my others had died. This beauty had the prettiest combination of white, pink and yellow. The bees loved it! Another pink one from my front border. This bed gets sun all day long and my gladioli bloom beautifully there. Deep red variety in my test garden. This one did not grow quite as tall as my others but had bigger blooms. Very lovely deep pink and white one. Needed staking or it flopped over. 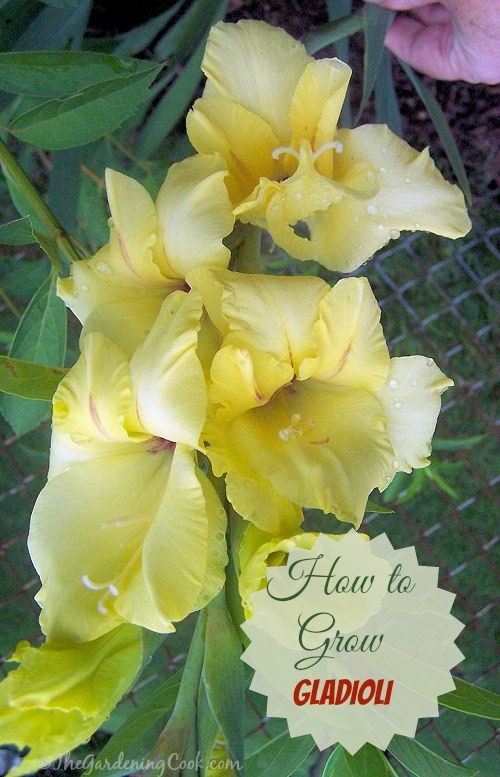 Do you grow gladioli? What are your favorite colors? Hi Leigh. Where do you live? All of mine flowered the first year. You could be using the wrong type of fertilizer too. Some promote leaf growth and some are better for flowers. My gladiolus just get leaves. This has been for 4years. They have full sun. These are all close together. Do I need to separate them is that why they get leaves. Hi Marsha. If they have never flowered, it could be because the bulbs were too small when planted. Larger bulbs give good flowers. If they have flowered in the past, it may be time to divide them. This should be done every 3-4 years. When you dig them up, you may see that the bottom bulb is shriveled and the corm growning on the top looks fresher. Remove the old bulb and dry them and then plant for spring. I just got 6 gladiolus bulbs from the dollar store, this will be my first year growing these. Hope you like them as much as I do Martha. The flowers are so pretty and perfect to bring indoors if you like cut flowers. Many years ago I filled an old trough with soil and planted some gadioli bulbs They never fail to give me a show. A few years ago I lifted them and split, the bulbs into two further pots, this year the newer bulbs flowered too. I adore these. What’s not to love about them, right? It’s also my first time planting them, ever, in all my 70 years. The first 4 of 15 corms planted started to bloom the middle of July. It is now the 1st of August and the rest are looking healthy and strong, so I am looking forward to more amazing flowering stalks. I planted 15 of mixed colours and have no idea what surprises I have in store colourwise. I had always thought of them as old fashioned and referred to them as such to my son-in-law when I showed off the first one in bloom. Mr. “Wisenheimer” corrected me and firmly stated that they are not old fashioned, they are “classics”. Never will I call them o.f. again.